Bike Tour "The Old Europe"
At first I must say thanks again to winds and weather but above all to my family and dog "Otto" who gave me free for another time. "Our Dad once in the year is in need of it" they say - so I better agree. The "Old Europe" may not be such a strange thing as the US-Warminister thinks, caused by a questionable reason. It is the area, where just the Americans - but the Japanese as well - like to travel: Heidelberg, Rothenburg ob der Tauber, Romantic Road and ... ok, wait some time to find this or that another place. So this time I stay away from coasts and sea and maritime stuff and turn inland instead. 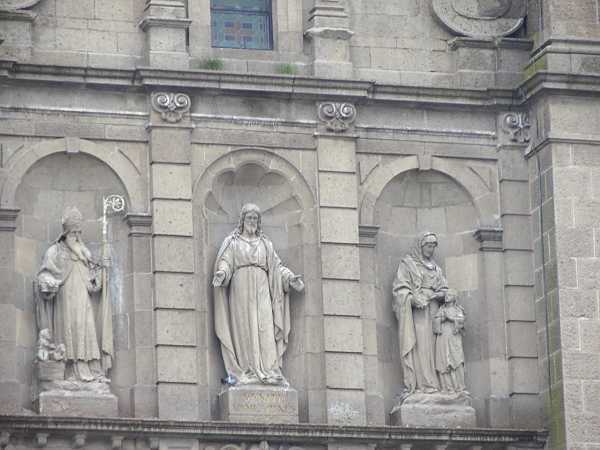 At first my favourite was the Jakobs Pilgrim Path or Road to Santiago. 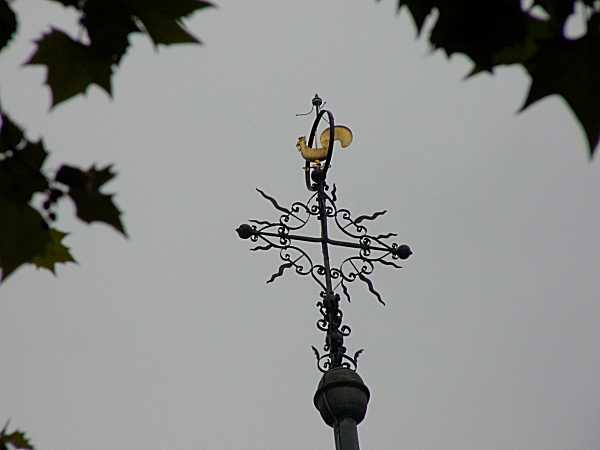 This has innumerable branches which are scattered all over Europe. One of those starts at Aachen, so this is my start too (In 1996 we started there for the "Kaiser-Route"). Now I will not stay to the pilgrims path but find my own route. My train gets off about 7 am, train change at Dortmund and at 12.07 we arrive at Aachen. Just behind the railway station there is the road towards Eupen/Belgium. Aside the road there is a cycle path leading slightly uphill. 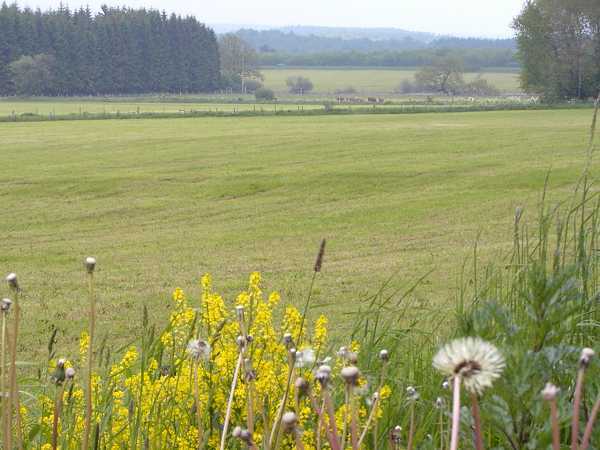 Then there is the border to Belgium. Since the Schengen Agreement there are no more border controls at all. Just a few booths selling fruits or vegetables or so. At Eupen there is a busy traffic, I have a rest and some photo-shots. "Do you like to occupy this place?" a woman asks me because I have placed my bike behind her car. "I run off at once" I say. 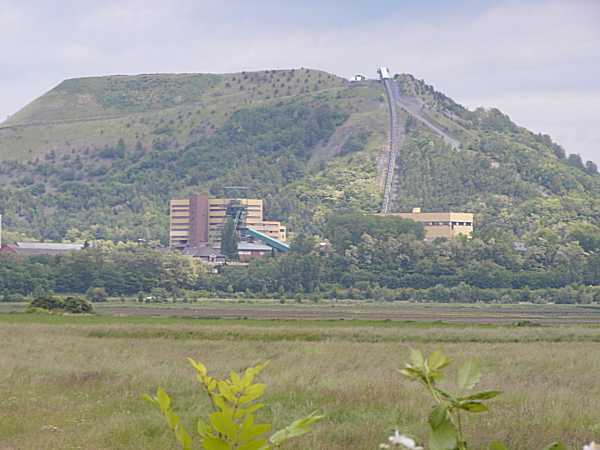 The region of Eupen-Malmedy has a changeful history. They were thrown between the German and Belgium nationalty for several times. Now it seems they all speak German, moreover in Colognian slang. 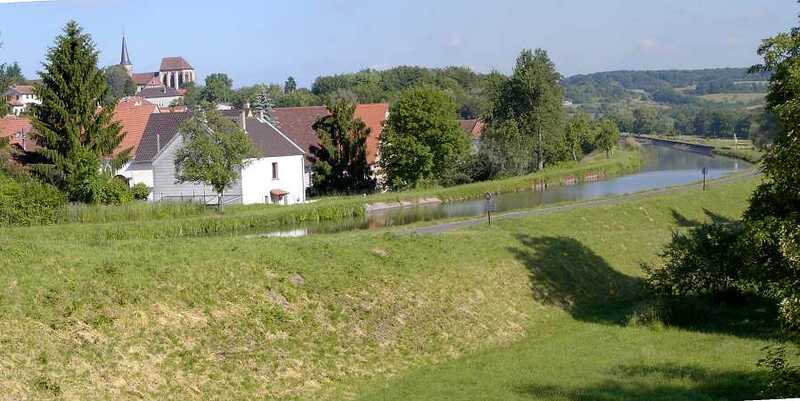 I resign to go to Malmedy, may be I reach my destination at the river Kyll today. But now we must cross the "Hohes Venn" and this is easy climbing for one hour. 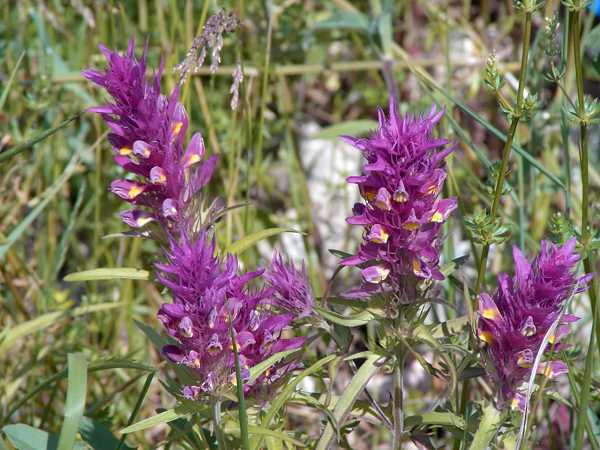 There are upland moors and vast nature reservation areas. Today it is too hazy to have far sights. 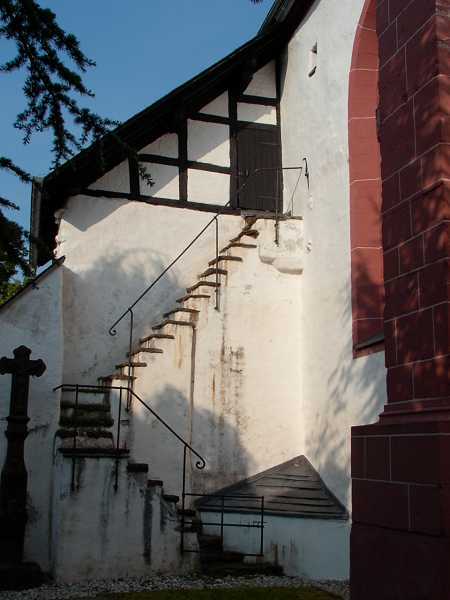 At the tower of the Signal de Botrange there is the summit at about 600 m height. From now on we run downhill and finally find smaller roads back to the German border at the Losheimer Graben. And I have the wind from behind all the time and this will be the same for the next days. So we soon reach the Lake of Kronenburg and the destination. 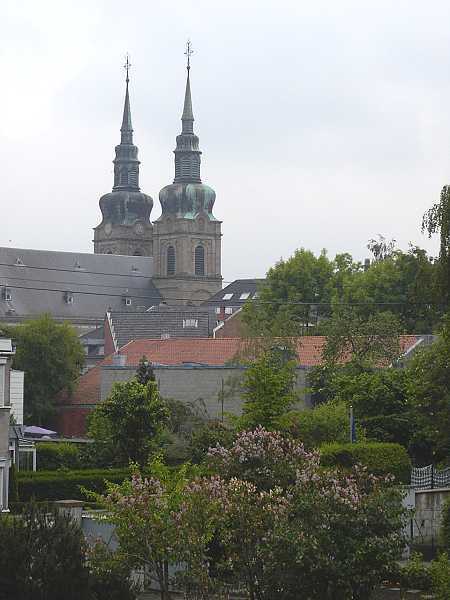 But it is surprising, that the town of Kronenburg is on the top of a hill. 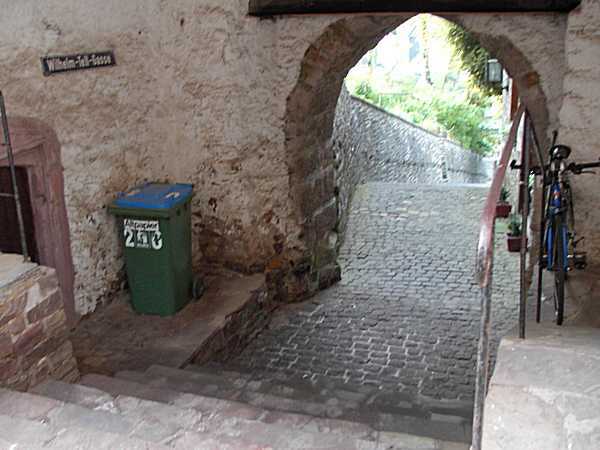 "Medieval town center" is to be read, so I push my loaden bike up there. 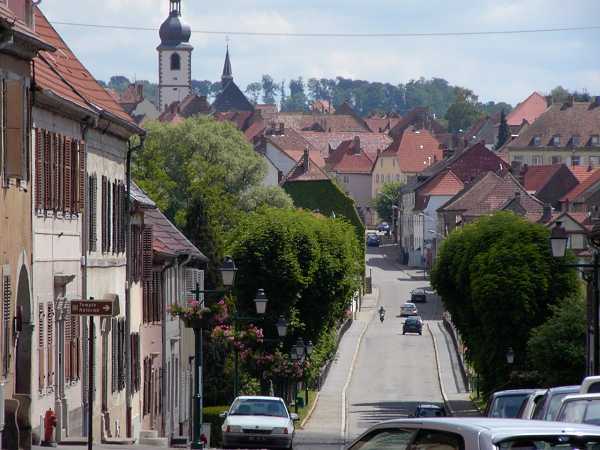 The town center is a single street or two with nice old houses. I cannot get a room at a private pension, they don't like one-night-guests as they say. A "Zimmer-Frei"-woman declares: "The room is to be made anyway" after she has fibbed that there is no free room in her house. So I end at the Hotel Eifelhouse around the corner. I get a room with an outlook over the valley but not so cheap. The bike is locked at an old town gate named Wilhelm-Tell-Gasse. At the hotel there is a young dog (Retriever-Labrador) named Anton. He tries to bite in my pants while looking for a game partner. So I must say: "Please stop that my dear, I only have these single pants". In the evening I get aspic a la maison with fried potatoes and salad. This is enough to refill the tank for the bike. A final walk and I find a board with informations about the Jakob's-Path. Then there is a path up to the ruins of the former fortification. There are only the remains of some walls and the half of a tower. The rest of the evening I sit at the open window enjoying the outlook and the baa of the sheep until it gets dark. Today we will ride the Kyllroute, length about 100 km. The river Kyll is rather unknown, as well the bike route which was built in 1993. So it is an insider's tip. 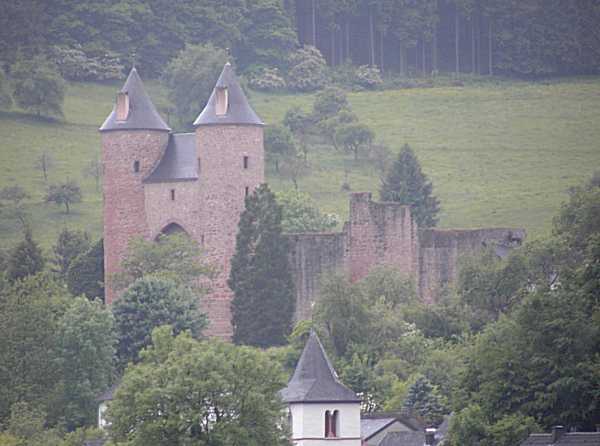 "At both sides of the route there are mills, castles, churches, chateaus, museums and picturesque villages of the Eifel" - so it is to be read. And a twisted railway winds its way through the valley (therefore some weeks later my norwegian friends Turid and Terje will come along here). Not so nice is the rain today. When I start I think "It gets brighter already" but this was an error because it keeps raining into the early afternoon. But as the wind comes from behind (north) this is not such a bad thing. There is often a slight downhill because we come from 500 m down to 130 m at Trier. The bad thing is: everything is grey and foggy clouds hang above the meadows and hills. So we have a brand new camera but no colours at all. Our main companions today are the grapevine snails. They have a moderate speed and so no collisions occur. We pass the mineral-water-town Gerolstein and castles like Bertradaburg or Ramstein and so on. 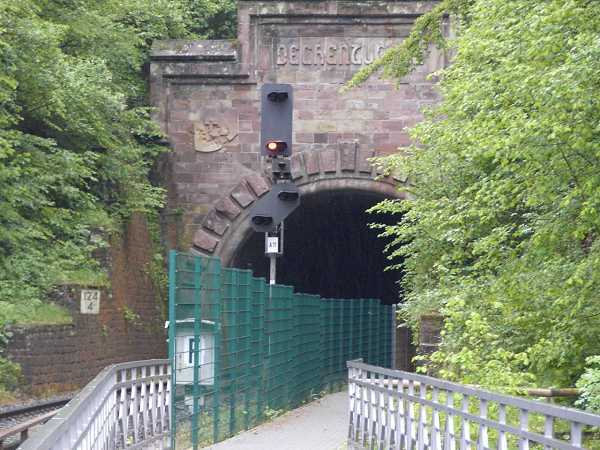 There are two passages through railway tunnels, where the cyclist finds a seperated lighted track. This is absolutely extraordianary. 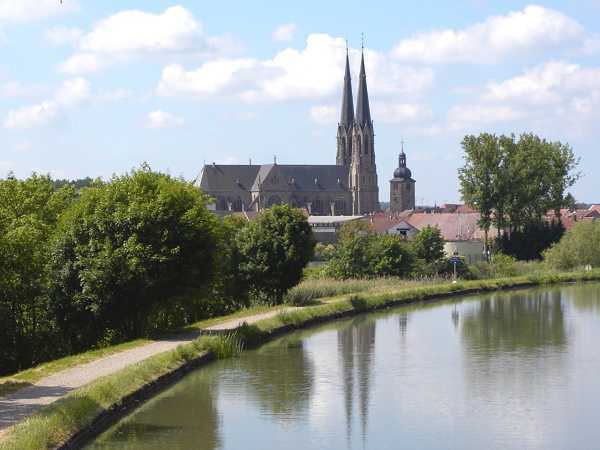 In the late afternoon we reach the river Moselle and near Trier industrial areas. Finally we come into the pedestrian area of Trier along the Moselle-bike-path. 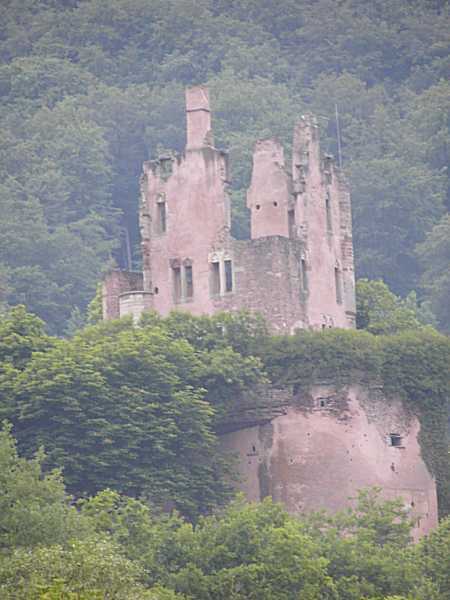 But I have forgotten to give a hint to a nice little place before Trier named Pfalzel. 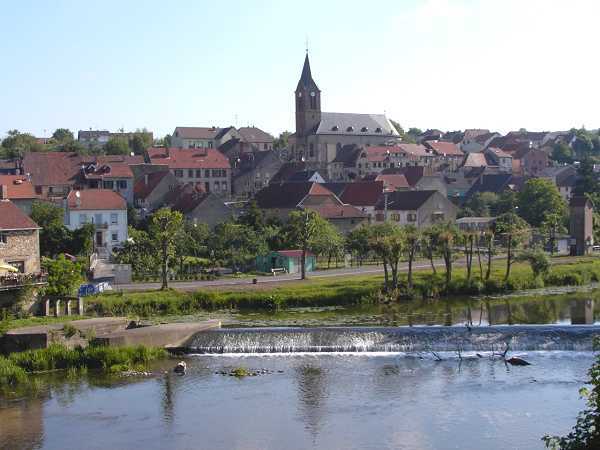 This is very scenic with half timbered houses, flowers, a cloister and nice restaurants. May be one finds a nice accommodation there. But meanwhile I stray around in Trier. There is a hotel with a Bett & Bike sign but everything is closed. So I find the Hotel Aulmann at a central place. And the Restaurant Peking is around the corner - if you know me better you will await what happens. I have a small talk with the chinese service maid to get a draught beer. But she doesn't understand me, so let us have a Bitburger or so from the bottle. But the meal is exquisite: pork sweet-and-sour and a heap of rice. There is no granule left. At first we have a grey day again but later on it will be better. The wind will not change and this is a fine thing. 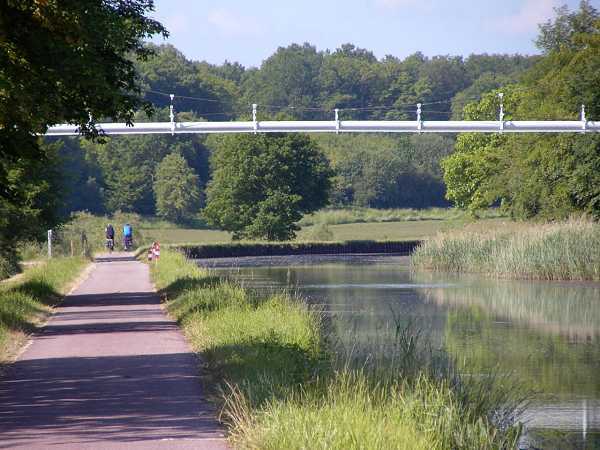 We will continue at the river Saar and now need the bikeline-guide. I don't like to buy all the brochures of a tour in advance for we then have a certain amount of weight which is useless. In the morning the book shops are still closed. So I start "blind". But the fine signs of the Moselle-bike-trail and since Konz where the Saar comes in the Saar-cycle-track avoid to get lost. Mostly the track leads along the river on traffic free tarmac surface. Around Kanzern you can choose from a fork: one route is short and leads along a canal straight ahead. The other branch leads around a slope of the river. This is the more scenic of course. We come to Saarburg, a nice town. Let us enter the centrum to find a book-store there. There is one and they can sell the bikeline-brochure, so I am complete now. 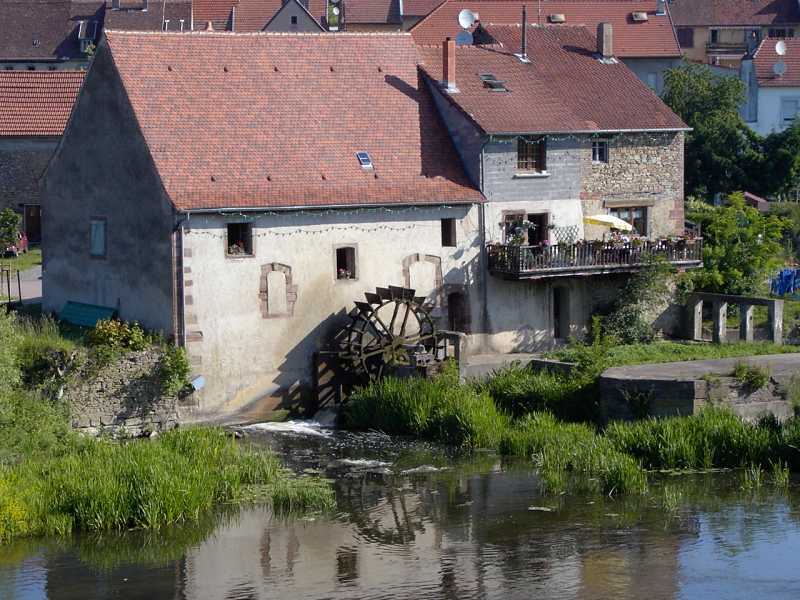 The main attraction of this town is a waterfall and some mill-wheels down at the river. It will be difficult to stitch the four photos to a single one, so until now look at the origins. Furtheron we follow the green loops and slopes of the Saar. After the town of Mettlach we await the famous 180 deg. loop. High above of the turnpoint of the loop there is a restaurant with an outlook named Cloef - unreachable with the bike. So I have taken a photo from the Net, let us hope that no one will complain about this. The valley now gets wide and the woods and slopes give way. At Saarlouis I leave the bike trail to reach the center and a super market. There is much trouble because they have a festival today and no motorized traffic is allowed. But the cyclist has no problems. As I leave the market I find a tick on my panniers. These are dangerous and can transmit a certain desease (Borreliose). But this was the only meeting with one of those beasts on the tour. I am pretty fast today caused by the good wind. 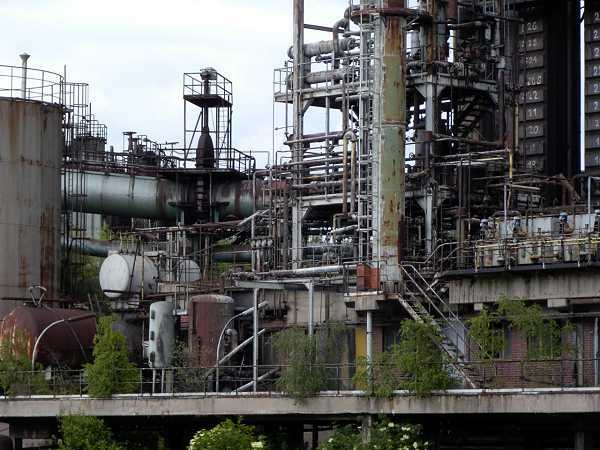 This is adequate because the landscape turns to be more and more industrial. Near the Völklinger Hütte (Saar Stahl) it nearly gets aesthetic. 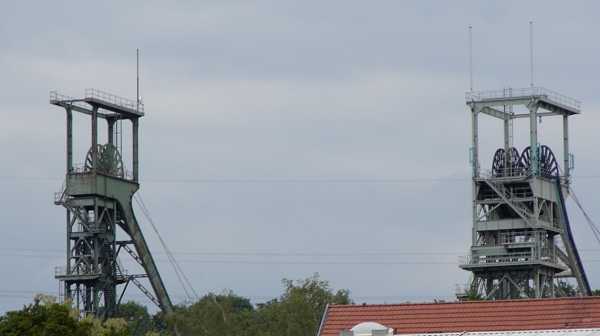 I observe two pit winding towers, where they mine the expensive and highly subsidised Saar-coals. 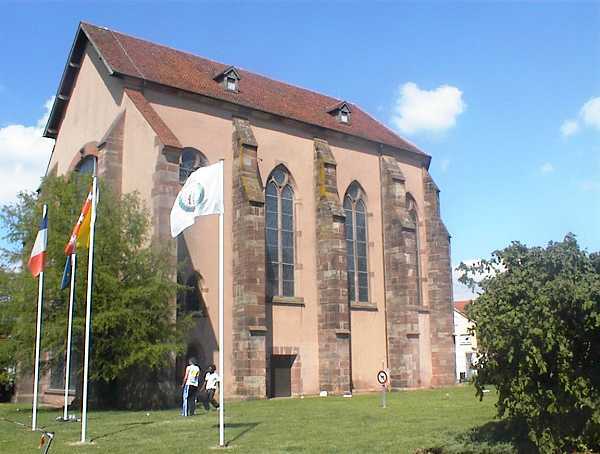 We then reach Saarbrücken. This should have been the final point for today. Sometimes I don't like places. 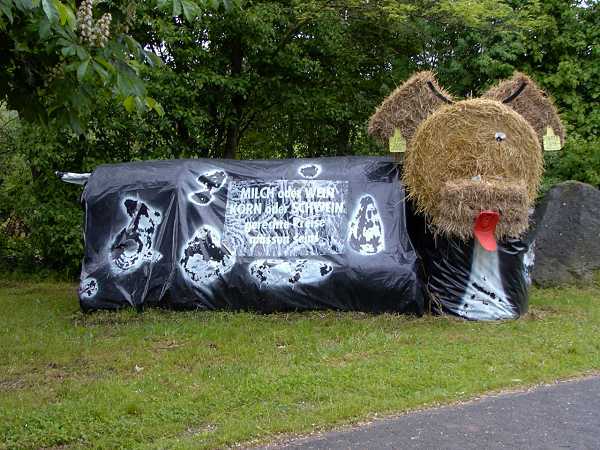 This time this is caused by another town-festival (Family's Celebration or so). Moreover there are lots of crying soccer-fans carrying banners of their soccerclub 1. FC Saarbrücken. Did they win? I ask a boy at the side of the street. Saarbrücken has won 2:1 against Schweinfurt and now ascends to the second German soccer league. This is not my theme. I continue awaiting the next occasion for an accommodation. There is a fine path along the river and soon we cross the border to France and end at Sarreguimines. I ask a gentleman to find a hotel and end at the Hotel Aux Deux Etoiles with a simple room and no breakfast. To pay in cash, they only accept French credit cards. But this was the only place in our common Europe. The monsieur demands me, not to stick the key of the door from inside of the chamber. May be if there is a fire or so? But I soon check out, that I can balance out of my window in the second floor down to the street in the case of an accident. This is academic gobbledegook. But on the street under the room there is a busy traffic, so we will not have a silent dawn hour. I look for a pizzeria but cannot find any satisfiable. But the Restaurant Shanghai, guess that I cannot deny to stay there. Then I am very disappointed about the meal and the mass (rice costs extra) and still am hungry. I find out, that the other guests order one meal after the other, so they surely will have enough. But you must ask your wallet as well. I still have some yoghurts and a spoon which jumped into my front bag at the breakfast-buffet last morning. During the night I must keep the windows shut because it is too noisy. I must start with an empty stomache. I still have some chocolate. Today we have Sunday and the shops are closed except fuel stations but those are not to be found in the botany. But we have the best weather: "Kaiserwetter" as we say in German. Now we detect picturesque scenes, a mill-wheel or nice villages now and then. 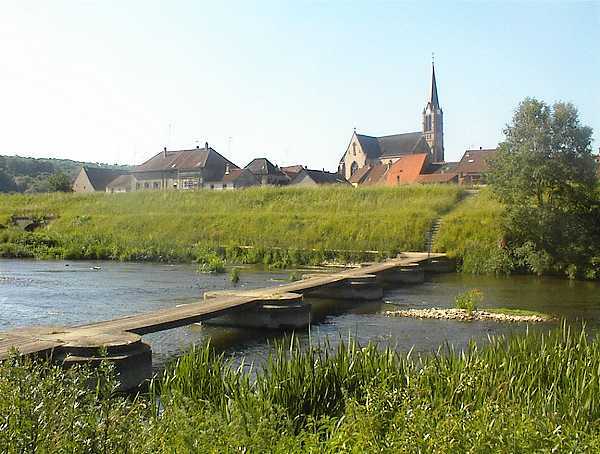 The track leads along the canal of the Saar with ancient sluices sometimes. The French cyclists hurry along in lycra dresses on high tech bikes. Where do they go all the time? But they all say hello or salut or bonjour or something like that. At a village named Zettin the canal path ends or the continuation sign was stolen? After a short stretch on the road we reach the village Wittring. I succeed to cross a provisional bridge and then crawl along a muddy tunnel under the dam. Funny! The path thereafter is bumpy but after some time it gets better. 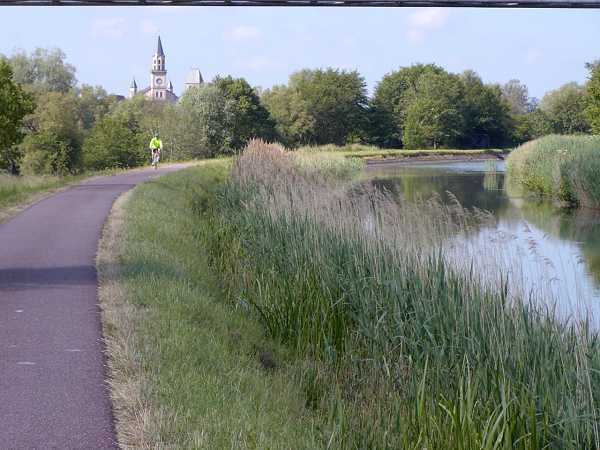 The name of the canal is Canal Houlières de la Sarre. At some place this canal turns inland into the wrong direction. If you don't be careful - and so am I - you must come back after some time, when you realize your mistake. 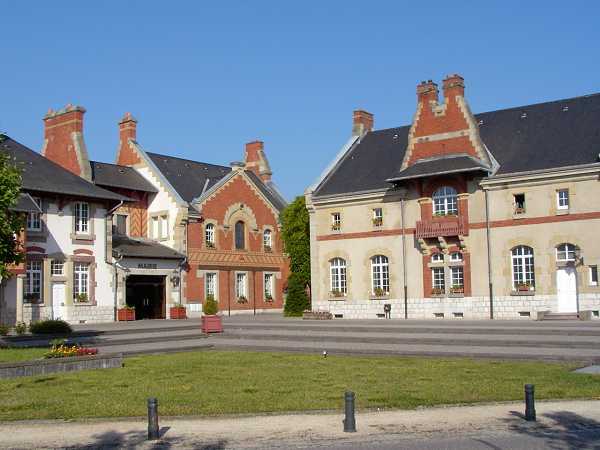 So we reach Sarre-Union at noon. Fine if there were a restaurant to enjoy any meal. But I cannot find something and run away from some motor-cyclists in leather suits occupying the only cafe at the place. At the next village I sit on a bench but immediately a guy comes up to scounge a cigarette or so. I throw my chocolate into the front bag and hurry on, up a mountain. And there is nice meadow with fruit-trees and I find my place in the shadow of an apple-tree. The chocolate is rather soft meanwhile. Some time later we push up a steep hill. On the top there is a forester's lodge or something like that named Maison Forestière de Bischtroff. We arrive there somewhat sweaty. Thereafter we enjoy a slight downhill which is worth the efforts from before. 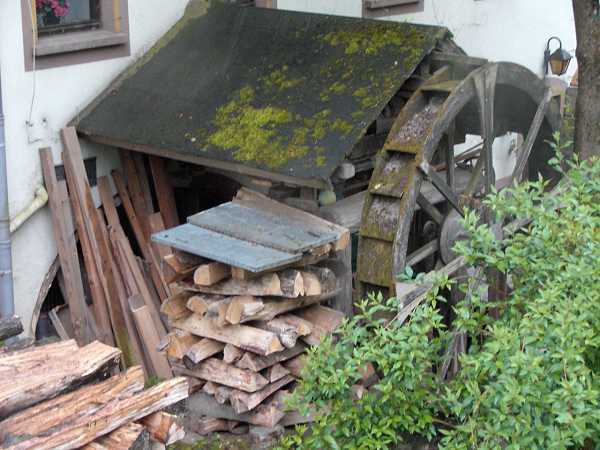 On the opposite side of the valley there is a picturesque village named Wolfskirchen. This village is up above at the slope and so it is to be seen from everywhere. 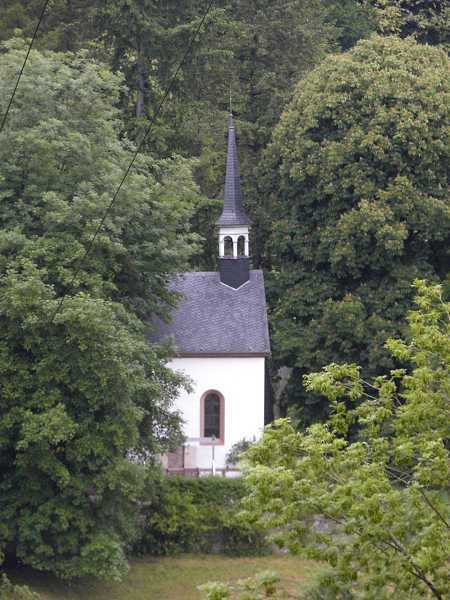 I arrive at the village Diedendorf and get lost down a steep road. Though I had had the occasion to study the map throughly during a former rest at the church. So back and up the same way, thereafter we reach the village or town Fénétrange. 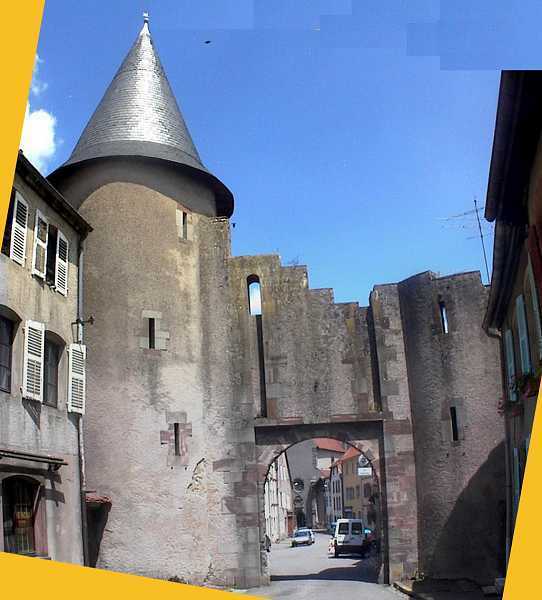 There are some old walls like a town gate or the inner courtyard of a chateau or something like that. For the rest of the route today we choose the shorter fork across the Herrenwald. 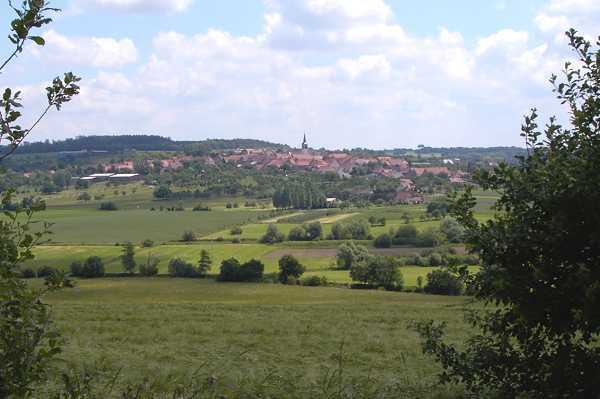 At the top there is a beautiful view above Sarrebourg, the end point of the Sarre-Bike-Path (the end for me - in the brochure it is the start). And what do you think - yes, you are right: there is another festival here. So the tourist information bureau has open on Sunday. 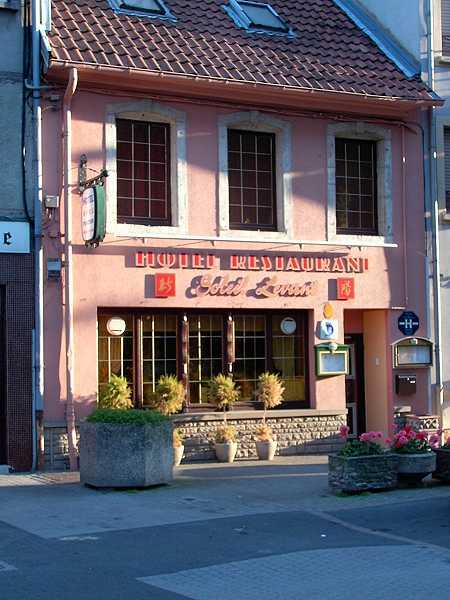 They phone to the next hotel around the corner and this is Hotel-Restaurant Du Soleil Levant. This is a Vietnamese one and the food is Asian and I don't bother... Before I may have a look into the Chapelle de Cordeliers, cost-free today as on every first sunday of the month. 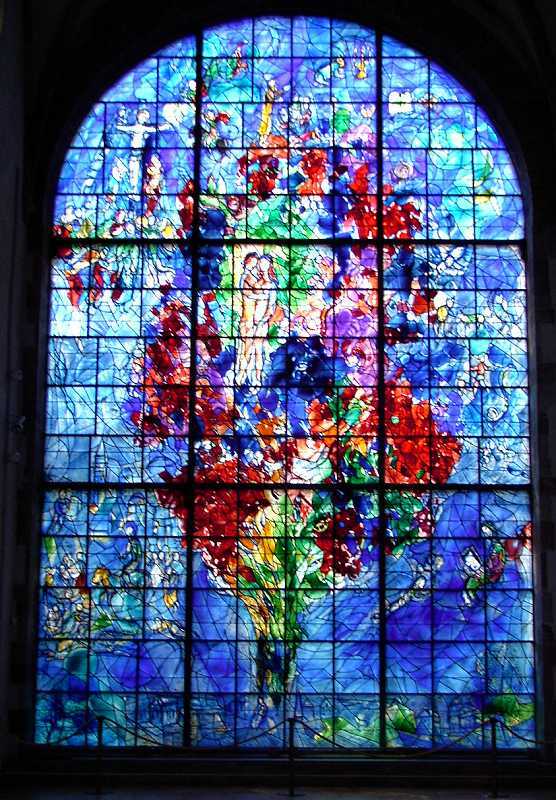 There is a famous glass-window created by Marc Chagall. This is prized as a monumental work of art named "La Paix". Somewhat like Adam and Eve surrounded by red flowers with a blue background. At the museum there is a gobelin of Chagall as well but this chapel was enough for me. The hotel is behind the nearby church and I get a nice room. 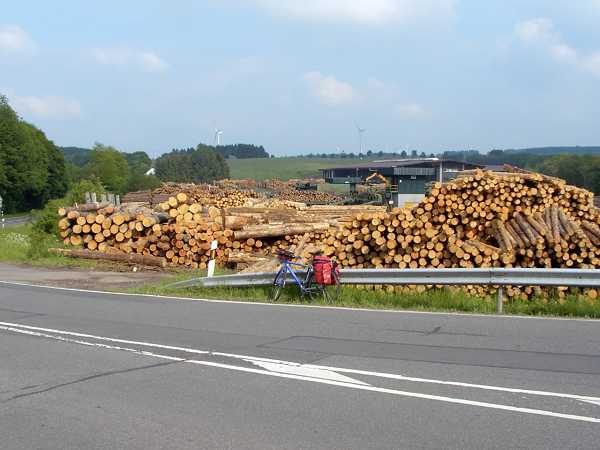 I then cycle to the railway station to get a road map of the Vosges area. I succeed and purchase a Michelin road map, so the further plannings can go on. For dinner I get a spring roll and Porc Grillè and Riz Nature. But tomorrow there will be no breakfast because they have their rest day on monday. So I pay my bill and can start as early as I will in the morning.